First Lines: July eleventh. A hot summer Sunday. All I want is some goddamned peace and quiet. Inspector Kari Vaara's career in law enforcement has been the polar opposite of easy. He's still recuperating from the severe injuries he sustained in Helsinki White as well as recovering from surgery to remove a brain tumor. He may still be a wreck physically, but one of the side effects of the tumor and its removal-- feeling no emotions whatsoever-- is slowly fading, and Vaari feels himself becoming a bit more comfortable in his own skin. He'd feel even better if his American wife weren't suffering from post-traumatic stress disorder. Kate, after ignoring him for weeks, has dropped off their infant daughter Anu and then disappears. But no matter how bad things get, Vaara feels that he deserves it-- and he wants to redeem himself. Possible redemption arrives in the form of an Estonian woman who begs Vaara to find her daughter, Loviise. Loviise, a young girl who suffers from Down Syndrome, has been enticed to Helsinki with promises of a better job, and her mother fears that she's fallen prey to human traffickers. For an understaffed police department, Loviise is just one more missing girl. For Varra, she's a chance to prove that he's capable of being the man he once was. He soon finds himself playing a deadly game of cat and mouse with enemies old and new. I have been a fan of James Thompson's books from the very first, Snow Angels, and this is one series that I do recommend people read in order. His main character, Inspector Kari Vaara, is made to walk through fire, and if you pick up a book at random to read it, you're probably going to miss too much for you to fully appreciate what he's going through. Furthermore, this is not a comfortable series to read. 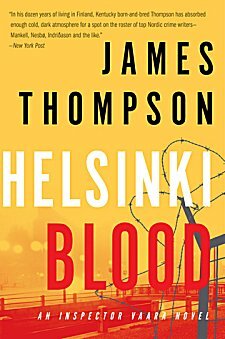 The picture Thompson paints of both Helsinki and of Finland is often depressing and violent, but through all four books, he's never let me forget that beauty has always been there and is worth fighting for. The inspector is a good man capable of doing terrible things-- and he does do them. Vaara reminds me of how many of the best "good guys" have a touch of the criminal about them. There's almost something mythic about this character-- the insurmountable odds he faces, how he is scarred as he fights monsters both real and imagined, how he always strives to do right and feels remorse and the need to atone when he doesn't measure up to his own standards (and those of his beloved wife). The success of these books will definitely depend upon each reader's comfort zone. If you don't like violence, don't read these books. If reading about a good man doing bad things makes you uncomfortable, stay away. And if you don't like the idea that there are men in high government positions all around the world who are corrupt and capable of the most heinous crimes, James Thompson is not for you. However, if you savor complex, dark, gritty, beautifully written stories about a flawed man determined to be and to do good, I highly recommend James Thompson. Yes, it's definitely the sort of series that you have to be in the right mood for, but if you are, it's excellent. Good grief! Yet another author to add to the list I want to try. Have you no pity?